Meet La Société Textile. Member of the Mile-End Business Association. 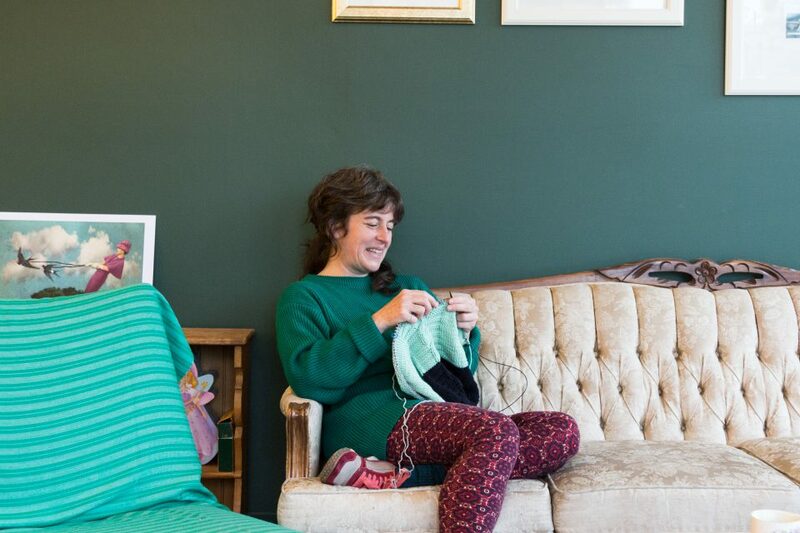 Amélie is the co-creator of La Société Textile, a new public space for gathering that champions camaraderie. 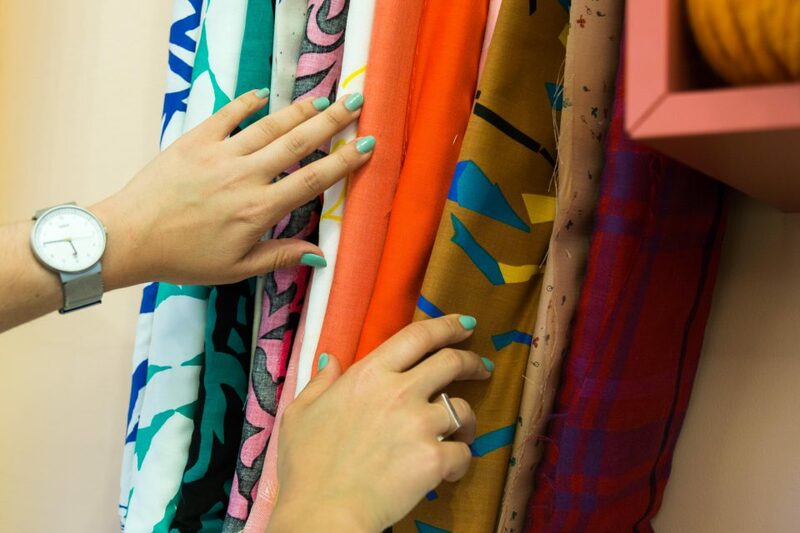 What sparked the idea for La Société Textile? It all started with friends. We have a knitting group and we knit a lot. Ten-hours-at-a-time, a lot. We’d knit in bars. We’d knit in coffee shops. Ten of us would knit for seven hours and have just a cup of coffee. We’d feel forced to buy cakes to up the bill! It was a motivating annoyance. 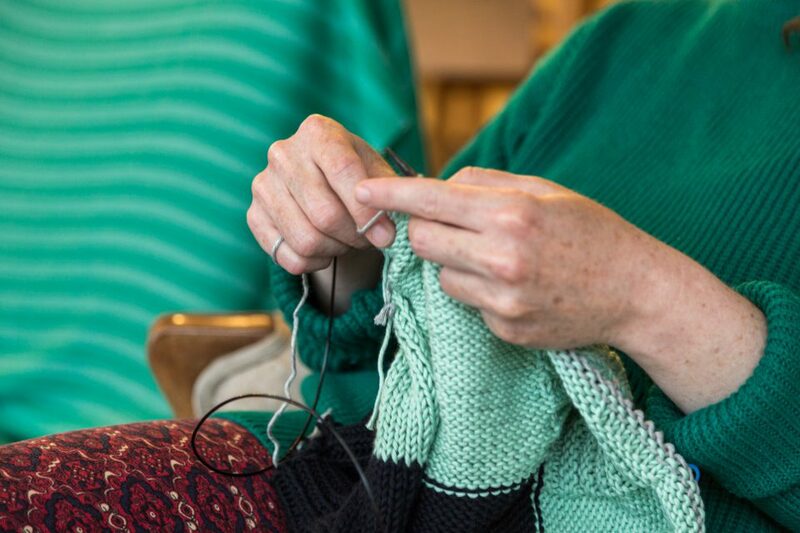 People would often see us and joke with us a bit, “Oh you’re knitting … that’s boring …” There are social stigmas around it. It takes time for people to realize it’s cool to knit! And then they come around, they’re like, “OMG, you knit what you’re wearing? That’s so cool!” We really needed a place to chill and knit. 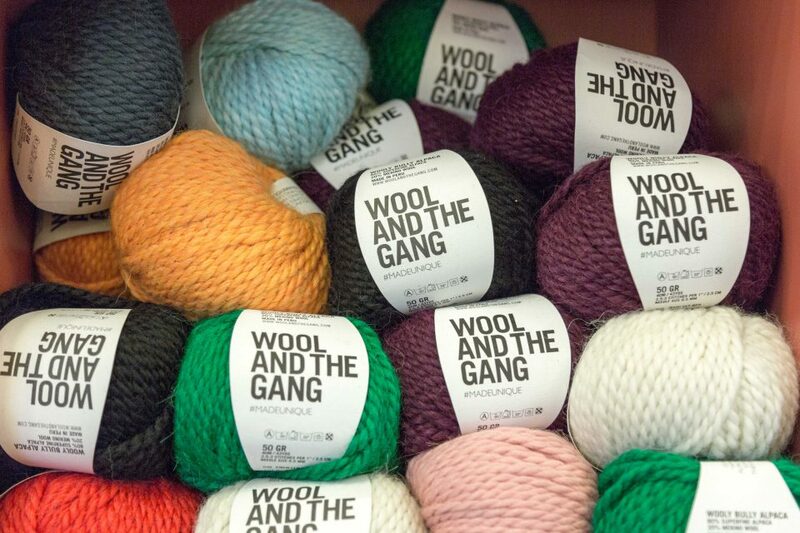 We dreamed of a place to meet, share, and pass knitting knowledge, to grow. My friends, Catherine and Maude, and I embarked on this adventure together. At the heart of it you built a new kind of social club rooted in sharing. Yes. A social space that isn’t your workplace or your home but where you can chill and gather. 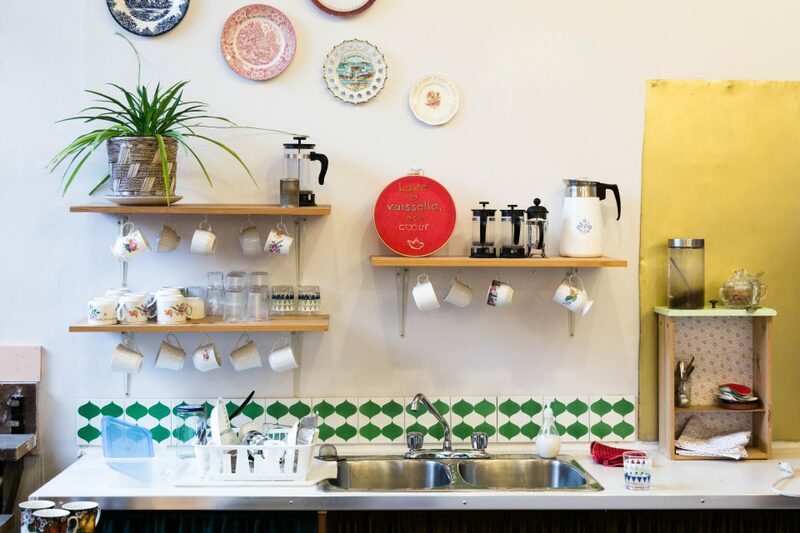 It’s not just a coffee shop, a classroom or a wool shop. We need to educate people who enter for the first time. Sharing is our ‘thing’, it represents our strength. At the end of the day, I’m proud when a client says, “Thanks, I’ve had a great time here”. And decoration turns the place into something like a grandma’s home. It’s welcoming with wool, wood and couches. We wanted to recreate this feeling of a family home. 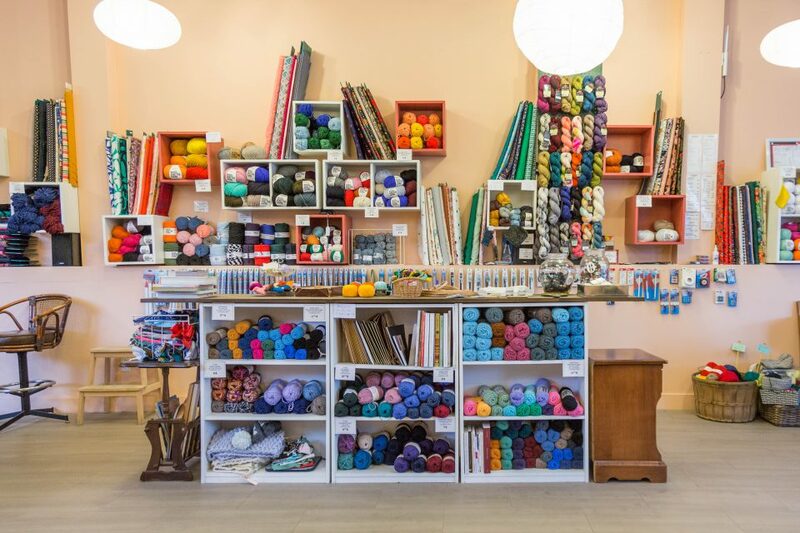 Besides a place to hang out and knit, what else can people expect to find here? 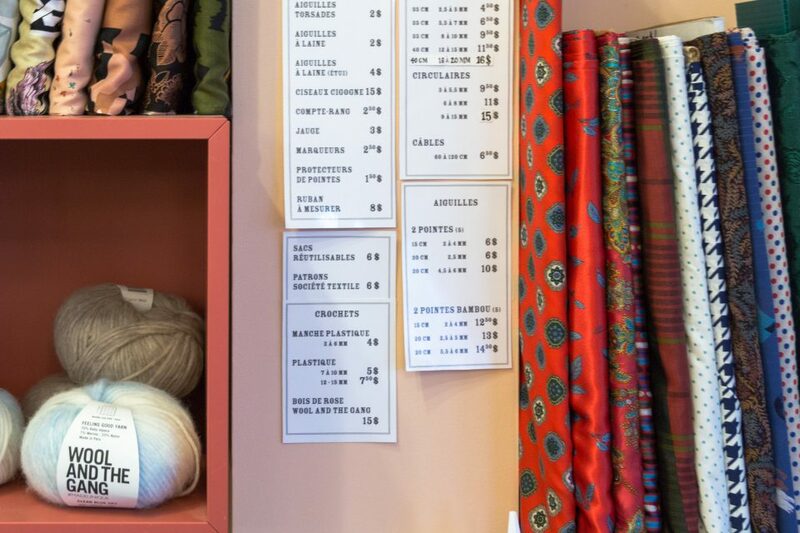 It’s a versatile space — a co-working place, a place to take embroidery, sewing and knitting classes, a shop to sell wool, and a place with self-service coffee in the back. Your logo is reminiscent of a kids game you’d play with friends. Ha! I’m a graphic designer and when it came time to create the logo, the girls automatically designated me to do it. I began to play with drawings of hands but it was difficult to find something which represented us as well as the project. One day I had an epiphany and thought about this sign. In Québec it’s a ritual for kids. While you play you say a riddle, or rhyme, together at the same time. Then you take your pinkie finger, you pull the string, and you make a wish. Our wish is basically this place. “Tricot, Couture, Camaraderie” marks the front of your social club. How do you encourage camaraderie? We love this word and it’s really important to reflect this spirit in our projects. The light meaning of camaraderie is a reference to a friend but at the same time, it has a strong resonance because it is the foundation of a social structure. 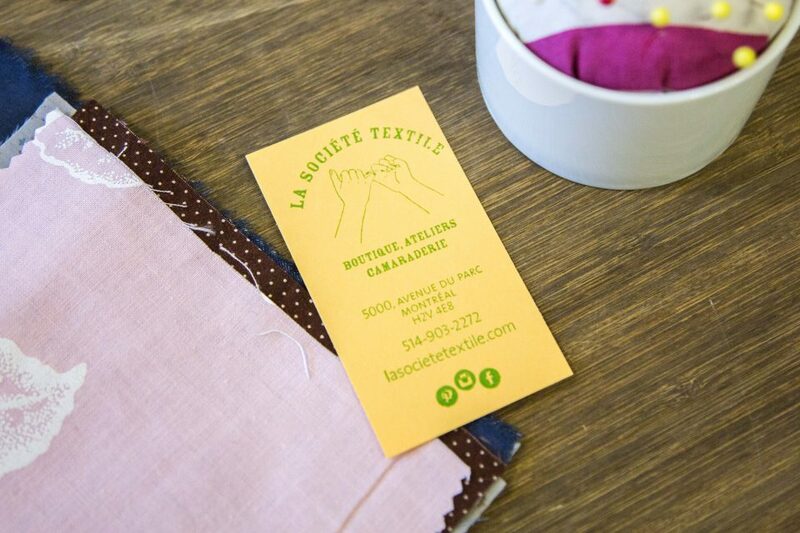 Like our name La Société Textile, it’s linked to the notion of a social mirror. We want this space to be a melting pot. Even if we have a majority of women, you also see boys. You see everyone. One of our recent workshops was hosted in a library and it was filled with only boys from 8 to 10 years of age who were making embroideries of constellations. 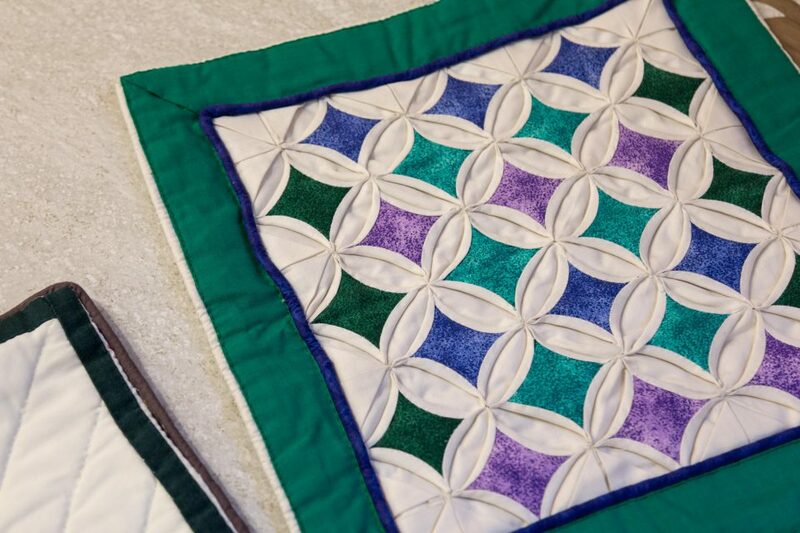 We believe there is no age for knitting, sewing, or embroidering. It is not reserved for the elderly! There is a human beauty to the mix. I’ve seen grandmas and young girls come together here, look at their work, and talk about it together. It fosters sharing, both ways. We have experts and beginners, young people and older people, boys and girls, and everyone. It’s better than our initial wish. How do you recruit your embroidery and sewing instructors? We do it in a punk manner. The teachers mostly find us. For example, our embroidery teacher passed by the storefront, came in, we discussed, and I asked her to share some projects. She was amazing! I said yes and now she has a place to share her knowledge. I would say our teachers are more than teachers. They’re artists and craftsmen who are here to perfect their art. They invent patterns, create their program, choose fabrics specifically for students and so much more. They have a desire to teach their passion, to talk about their art, and we give them a forum for that. This alchemy makes sharing fun! Transmission of knowledge is our first value. Who are your Mile-End comrades? We have partnerships. Our coffee is from Café Pagaille and they also have a catering service. Our tea is from Marie Thé, a few blocks away. The community is a pillar. We are merchants and entrepreneurs and sometimes it’s not easy. It’s comforting to visit your friends on av. du Parc! Merchants, neighbours … at the end they’re all comrades! On a walk around Mile-End, where do you stop? With Maude, when we have a big day and want to relax, we go to Bistro Lustucru, a raw bar. They make tartare, carpaccio and so on. They have an amazing prix fixe menu, it’s our reward and our solace! The best lasagnas in town are made at Lasagne du Plateau and the owner closes his doors once a month to do it. Oh, and Antoine au Quotidien! Their molasses cakes are basically artwork. I “Instagram” their molasses cakes.